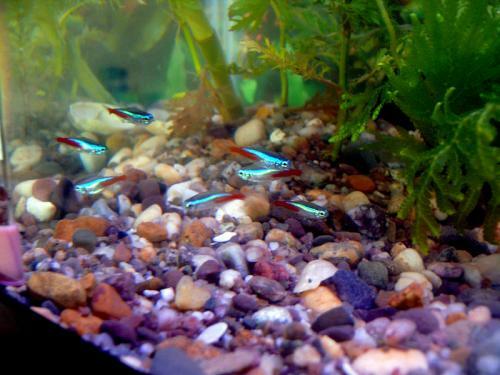 The right lighting for your aquarium can make your fish look prettier, such as the neon tetras in the photo above. However, there are other, more important reasons for choosing the proper lighting for your fish tank. Proper aquarium lighting provides energy for aquarium plants and photosynthetic animals. 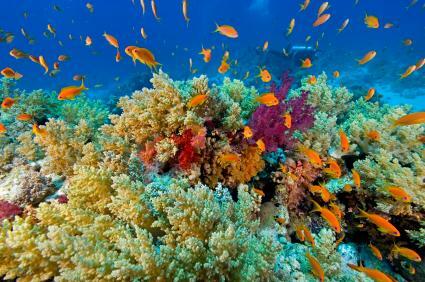 For example, live plants and corals will not survive without the proper lighting. You'll sometimes see people keep fish only tanks with no lights, but this isn't recommended. The light fixture itself, called the aquarium hood, prevents water evaporation and more importantly, it prevents your fish from jumping out of the tank. You want your aquarium lighting to simulate natural light as closely as possible. You should keep your aquarium lights on for about 12 hours each day. The type of lighting you need for your tank will depend on what type of aquarium you set up. For example, a freshwater aquarium with both fish and plants will need more light than a fish only tank. Aquarium lighting is especially important for marine aquariums with corals. There are different types of aquarium lighting systems: incandescent, fluorescent, metal halide, and LED (Light Emitting Diode) lighting. An incandescent lighting system uses the screw-in type bulbs and is the oldest type of aquarium lighting. The bulbs produce quite a lot of heat and I'd recomment fluorescent lighting instead. Fluorescent lighting is a good general purpose lighting type for freshwater aquariums and fish-only marine aquariums. This type of lighting is energy efficient and does not produce much heat. The bulb type is often chosen basically for aesthetic purposes for best viewing your fish. There are several types of bulbs available. It is best to use a full-spectrum bulb which should be changed about every 6 months. For coral reef tanks you should use a metal halide lighting system. Metal halide bulbs are available in different wattages and colors. However, one drawback is that metal halide lights produce high heat and energy usage. However, metal halide lights usually produce the best results for corals because metal halide lights most closely resemble natural sunlight and also penetrates deeper into the tank than LED lights. Because halide lights generate heat, cooling fans are often used with these systems. Some people use LED lights with coral reef tanks, however, most people get better results when using metal halide lights. The benefits of LED lights over metal halides is that LED's produce less heat and use less energy. In addition, LED bulbs last much longer than metal halide bulbs. Although LED lights can be used as the only light source, they are sometimes used as supplemental lights. LED aquarium lights also make good lighting systems for freshwater aquariums, especially those with live plants.